No need to swing a leg over the new Kymco Spade—just go ahead and walk up from behind and plop down on the 28-inch seat. Crank up the engine, twist the throttle wide open and let the engine fly through the gears. In your mind you’ll be burning up a race track. In reality, you’ll barely be in danger of breaking the speed limit. What’s not to love? Never has 44 mph felt so fun. The Spade is a 150cc motorcycle that taps into the the retro/custom fad in motorcycles on a miniature scale: A low seat, 12-inch tires, one cylinder and air cooling. It’s happy carving up your urban commute or rocking a back roads jaunt. And it’s yours for a paltry $2,999. While the Taiwanese company is best known for its reasonably-priced scooters, it has been making motorcycles and engines since it started as a manufacturing partner for Honda in the 1960s. Kymco bought out Honda’s stake in 2003 and has since been focusing on selling motorbikes, ATVs and side-by-sides around the world since. Everybody in the motorcycle industry is hyperventilating about losing the millennial demographic. Bikes are too expensive, they say. Bikes are over-powered and too high-tech, they whine. Give us something cheap, simple and hip, they plead. Maybe then all that ails us will be cured! The Spade seems to hit on all those points: It’s easy to ride, it’s not going to scare the daylights out of you on city or back roads, and it’s a conversation starter (I had several people ask me what it was at gas stations and at stoplights.) “Where’s the rest of it?” was my favorite good-natured jab. Most importantly, it’s great fun to ride. 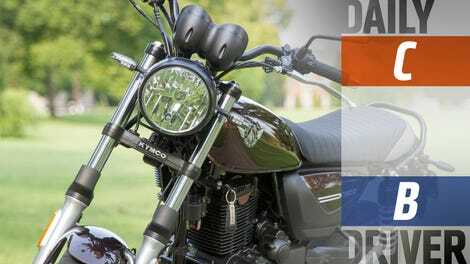 So this may all sound familiar if you’ve ever heard of the Honda Grom or the Kawasaki Z125 Pro. Both come in at about the same price (the Honda is about $300 more), and all three roll on 12-inch tires and have similar dimensions. Where they differ is in style. The Honda and Kawasaki have that futuristic streetfighter look, while the Spade looks more like a Universal Japanese Motorcycle of yore. The competition? The Honda Grom, left, and the Kawasaki Z125 Pro. There’s also an increase in performance with the Spade. It has five gears, compared with the four on the Honda and Kawasaki. 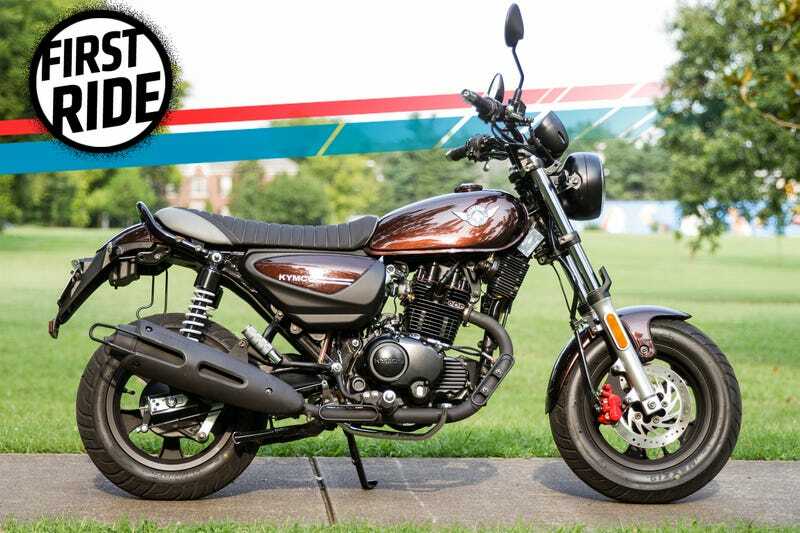 While the Japanese manufacturers don’t advertise horsepower for their minibikes, dyno testing by the good folks at Motorcycle.com suggests that the Z125 has 8.3 horsepower, while the Grom churns out 8.7 (yes, in this segment, horsepower is measured by the decimal). The Spade’s claimed 12.5 horsepower at 7,000 RPM may not sound like much on its own, but that’s an increase of a 44 to 51 percent over its other mini-rivals, so it’s nothing to sneeze at when it comes to relative power. It’s hard not to grin ear-to-ear when perched on this little bike. Nobody seems to mind when you cut between traffic or park it on the sidewalk while running into the store. It’s like having a scooter, without the (unfair) stigma of having a scooter. The handlebars are all of 30-inches wide, so I just rolled it into my back door at night so I wouldn’t have to worry about someone making off with it. Twice, while hooning the bike through twisties, I had law enforcement vehicles come up on me through blind corners in the opposite lane. Both times I had to fight the instinct to grab hold of the brake lever in an surreptitious-as-possible manner (my usual, not-always-successful tactic to divert police attention). But both times it wasn’t necessary. The the low seat height combined with revving the engine along the redline creates a grand illusion of speed, but neither time I thought I was speeding had the bike venture into extra-legal territory. Plus, I like to imagine officers would probably just be too amused by the little bike to really do something as terrible as write it—and you—a ticket. The bike is fitted with both a side stand and a center stand, and there’s a power outlet in the dash to keep you electronics charged. Handy. The bike’s utility is limited by its speed—or lack thereof. At full bore on a flat road, I managed to eke about 60 mph out the bike (though I acknowledge my 230 pounds might have had something to do with holding the machine back). Despite the inexplicable joy of riding a slow bike fast, there’s little doubt that this bike is best suited on roads where speed limits are 55 mph and below. The suspension also didn’t quite seem to be up to the match of my weight, jarring my backside when I hit the occasional pothole. Though I acknowledge the bike is probably be aimed at a more slight and svelte clientele. The 220mm front disc brake does a good job for most slowing down, but the 140 mm rear drum brake is a throwback I could live without. Anything more than a gentle depression of the foot brake tends to induce lockup on the rear tire—which makes for some fun screeching noises on the road, but doesn’t inspire a ton of confidence in a panic stop. At a claimed 91 mpg, the 1.6 gallon tank should in theory be good to get you close to 150 miles. But the lack of a fuel gauge requires a bit of guesswork about when you’re about to run out. There is a low-fuel light, but it seemed rather pessimistic about actual remaining range. That said, there is something satisfying about topping off the tank with all of one gallon of gas. I spent all of $2.02 at the local Costco the weekend I had the bike. I also managed to inadvertently touch down my boot while trying to shift in a traffic circle, and dragged a peg going around a switchback. Just a little bit startling under not-so-hard riding conditions. Kymco isn’t exactly a household name in the U.S., so it might not carry the long-term cachet of the Honda Grom on the used market. But starting at just $2,999, there’s not a ton of room to go down in price. These bikes have a good chance of being the kind of motorcycle you buy, flog around until you start lusting for a new challenge and then sell for a similar amount that you bought it for. In other words: The best kind of motorcycle. Kymco already has an aftermarket provider in small bore experts MNNTHBX, offering everything from their own upgraded fork springs to a custom exhaust system. Also available are Öhlins fully adjustable shocks, Rizoma bar-end mirrors and ASV levers. Pretty cool stuff. But if you get carried away with the accessories catalog, it’d be pretty easy to double the price of the bike before you get out of the dealership. I’d love to have one as a second bike, to throw into the back of the van for family vacations, to show up the paddock scooter crowd or to ride to a prime parking spot during busy downtown events. My regular ride touts more than 10 times the horsepower of the Spade, plus all sorts of electronic aids absent from the minibike like traction control, ABS, ride modes and so on. But the Spade offers boundless joy at a fraction of the performance and —more importantly—the price. Great for local runs, stay off the highway. Great for carving, stay off the highway.